Lovely Langeland Cherry finish mantel clock. Clock measures 13.5 inches tall by 10.5 inches wide. 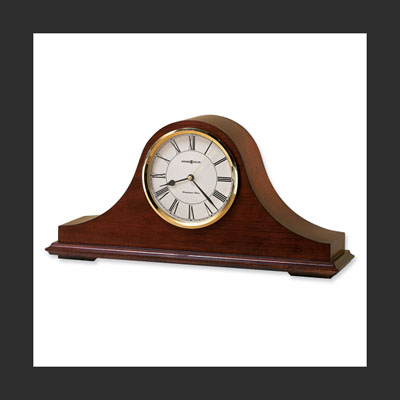 This clock is a beautiful mantel accent for any home. Features include; Westminster chimes, auto nighttime chime shut off, quartz movement, ivory dial, Ave Maria chimes, cherry finish, brass accents, and an included Warranty Card. Lovely Badash Crystal firestorm urn vase. This vase measures 11 inches tall by 11 inches wide. This vase is hand blown glass. Kegan Pewter finish quartz night glow alarm clock. This stylish alarm clock measures 5.75 inches tall and 4.25 inches wide. Clock features an antique finish, alarm, quartz movement, beaded border, white dial, ac adapter included, light, and pewter-finish. Mission Blue Iridescent reptile finish alarm clock. This clock measures 5.25 inches tall by 4.25 inches. Clock features a snake texture, polished nickel plated finish, white diamond, alarm, and roman numbers. Complete with a warranty card. Beautiful Dale Tiffany Ainsley Desk lamp. This lamp is about 19.5 inches tall, 13 inches wide, 5.5 inches long, and weighs around 8 pounds. Features an antique bronze finish and lovely handmade stained glass shade. Will look fabulous in your home on on your office desk, a great match to the table lamp. Pretty Dale Tiffany Favrile Lesley vase. 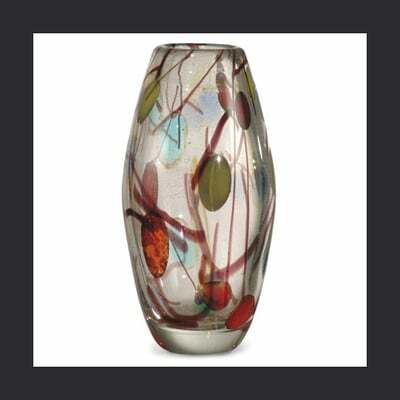 This hand blown glass vase measures 9.25 inches tall and 5 inches wide. Beautiful art vase. Beautiful Dale Tiffany Irene Mini Table lamp. This lamp is about 11 inches tall and weighs around 3 pounds. Lamp measures 6 inches in length by 6 inches in width. Pretty flower stained glass shade is handmade. A serene accent in your home. Beautiful Badash Crystal Evergreen square vase. Made in Poland, vase if created from lead free Crystal. Lovely accent in your home. Perfect gift. Walker Rosewood and nickel finish quartz alarm clock. Clock measures 5.25 inches tall by 4.25 inches wide. Beautiful accent in any home. Features include quartz movement, an alarm, black hands, white dial, nickel plated, roman numerals, polished and satin, rosewood finish. Batteries included. Lovely Silver plated five piece coffee and tea service. Coffee pot, tea pot, sugar, cream, and tray complete this set. Measures 25.75 inches tall, 12 inches in length, and 14.5 inches in width. Set weighs about 20 pounds. 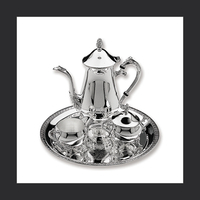 An elegant gift idea for the coffee or tea lover. Unique modern design Badash glass and aluminum Elvis vase. This beautiful vase measures 13 inches top to bottom and weighs about 4.4 pounds. Beautiful handcrafted vase created from glass and aluminum. Handsome nautical style mahogany "Grand Admiral" chest clock. 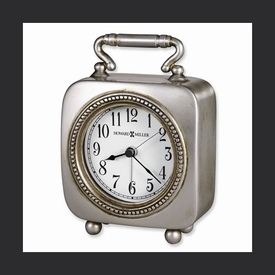 Beautiful clock is engravable and measures 6 inches tall, 9 inches in length, by 7.5 inches wide. 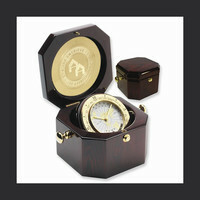 Features include Arabic numerals, wood, brass accents, a mahogany finish, engraving plate, and batteries are included. Very handsome nautical design. Delightful Sea Turtle glass figurine. Lovely hand crafted glass figurine features 22k gold gilding and Swarovski Elements. Adorable figurine measures 2.5 inches wide by 2.75 inches tall. A wonderful gift. Lovely Badash crystal blue and green teardrop sculpture. This beautiful teardrop shape sculpture is 10.5 inches top to bottom and weighs about 5.2 pounds. Sculpture is hand blown glass, a gorgeous accent for your desk or table. Wonderful Howard Miller cherry finish quartz mantel clock. 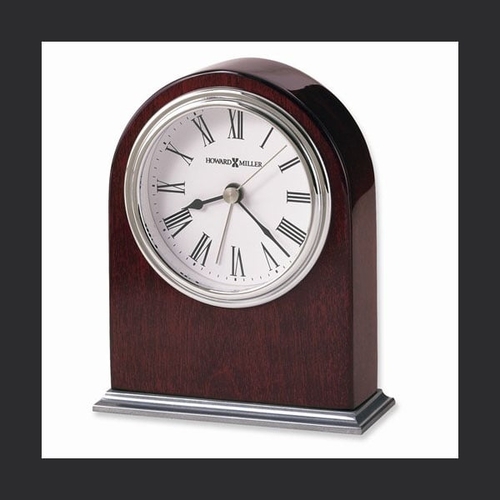 Beautiful clock measures 17.75 inches in length by 4.75 inches wide and 8.5 inches tall. Clock features brass accents, quartz movement, cherry finish, Roman numerals, Westminster Chimes, and auto nighttime chime. Batteries are not included. This attractive mantel clock looks at home in just about any decor. Adorable Vintage Bicycle clock. 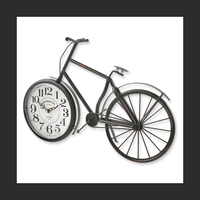 This great clock measures 19 inches in length by 13 inches wide and weighs about 2 pounds. A fantastic room accent for any style. Delightful Dolphin and Baby glass figurine. Lovely hand crafted glass figurine features 22k gold gilding and Swarovski Elements. This figuring measures 8.5 inches tall and 8.5 inches wide. A wonderful gift.